In November 2010, we reported that Apple was to open a new retail store in the heart of Amsterdam, taking the place of an independent art gallery on the ground floor of the Hirsch building at the Ledseplein, a building where it already occupies offices. It appears that Apple’s plans for the store are dividing opinion in the city. Advisory committees have said that a central spiral staircase and plans to modify the exterior of the Hirsch Building would be blocked because of the buildings national monument status, a potential blow for the Cupertin-based company as their permission is paramount to begin work. However, Apple will likely be given the necessary permit to begin construction after the municipality of Amsterdam overruled the experts, noting that the store would be too important for the cities economy. Apple reportedly obtained permission from the City of Amsterdam and was said to be in the process of acquiring staff and selecting builders to renovate the ground floor of the building in November. Even then, it was thought the company was awaiting a permit before it could begin work. If plans aren’t met with any further opposition, Apple should be able to begin work on June 10. 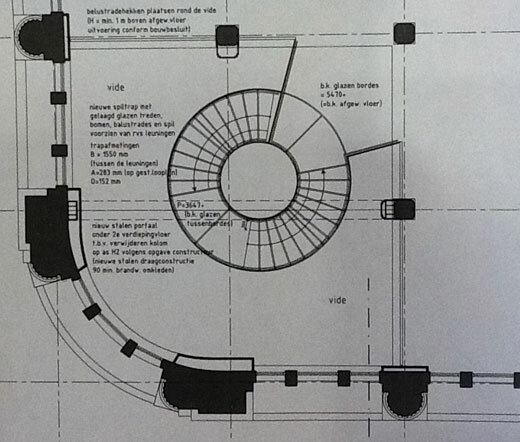 Apple has remained quiet on plans but dutch blog One More Thing managed to get its hands on plans for the store, showing the company’s blueprints for its customary spiral staircase, all but confirming Apple’s plans despite no official announcement.